Good morning! So excited today to be hopping along with Pinkfresh Studios as we celebrate the BRAND NEW October Release! You aren't going to want to miss a stop along the way - TONS of inspiration and prizes up for grabs! YAY! I have a $25 gift card up for grabs here on my blog (details below) - and the ENTIRE RELEASE is up for grabs as well! See details on the Pinkfresh Blog! Pinkfresh Studio is also having a special promo in honor of the new release! 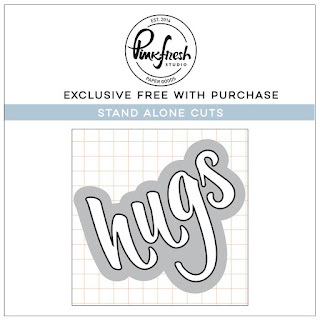 Between now and October 11th head to the Pinkfresh Studio Store and use code "OCTFREESHIPWITH50" for free US Shipping and $5.50 off international shipping! If you are following along the hop, you should have arrived here from the fabulous Emily Midgett! These florals are so fun to stamp with and build lovely backgrounds! So easy to fill in with the solids, outlines, and small elements as well! And the sentiments as well are fabulous - most of them work fabulously on their own and some like this that work perfectly to build a custom sentiment. And that font! Isn't it so pretty?!?!? Some layers, some Nuvo Jewel Drops scattered around, a tiny paperclip with some jute string tied on - then everything mounted on a kraft cardbase finish this card off! Next up - I couldn't resist these little cuties from the new Happy Hugs! Aren't they adorable?!?!? I used Distress Oxide inks on the background in two tones for a fun ombre type effect - darker in color around the edges. Then I stamped the bears in the perfectly placed cut out - there are also coordinating dies, but I love how they fit perfectly for one layer cards too! I colored the cuties up, and then added another white paper layer, and a scrap of pattern paper from the Holiday Vibes 6x6 Paper Pad stitched on the bottom. Finally, a few Holiday Vibes Enamel Dots, and then some sparkly Nuvo Drops on the snowy areas to finish it off! Your next stop along the hop is the always amazing Jennifer McGuire - make sure and head there next! 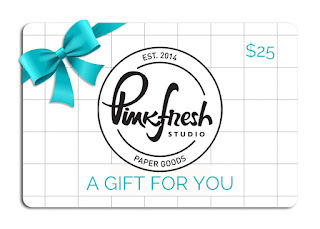 Make sure and leave a comment before you leave for a chance to win a $25 gift certificate to Pinkfresh Studio! Winner will be chosen and posted on the Pinkfresh Blog on Sunday, October 14, 2018 - so make sure and check back to see if you were a winner! Winners must check that page and claim their prize within 2 weeks. Here is the entire blog hop line-up so you don't miss a single stop - and product links are below - including affiliate links where possible, which simply means if you use one of the links below that I receive a small commission at no additional cost to you. Thanks so much for stopping by! Have a wonderful day!!! The Snuggle is real!!! I love this card, you made the stamp really stand out by adding the snow filled sky. Both cards are so nice, but I'm a tad partial towards the bears...too stinking cute! This is going to be my new motto..getting older and I am going slower! Love it. Beautiful card! As always, beautiful cards! Pinkfresh hoarding is one of my many crafting weaknesses! I love both your cards but your bears just warm my heart. Your coloring and the colors you used are perfect. Great job!! What sweet cards. Thanks for the inspiration. first card is such a beautiful design; a lovely flower garden! Love the inspiration cards. Especially the first one with the beautiful sentiment. I really love this release. It has so many great products! Love these! 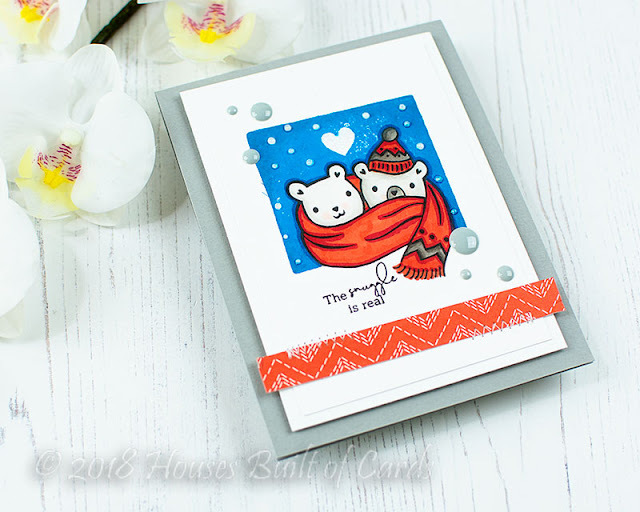 The flowers on your first card are so pretty and those little snuggly bears are adorable. Your cards are fantastic! I love the sentiment on the first card. In the words of my 11 yr old daughter, this was another awesomesauce release! Love it all but that My Favorite Things To Say stamps is tugging at me! A great sentiment on the first card and it is colored so beautifully. The second card is simply adorable. Love your cards especially the one with the flowers. I’m digging the sentiments also. Great cards. I am always amazed at how hop participants can make me switch a card from "maybe" to "must have"
Wow... I love your cards! Those cuddly bears are killing me! Great cards! This release is all-encompassing, thanks to the variety of images and sentiments. You have used them well. Aww. . how sweet the cards~! So very creative! LOVE your creations! The first card's sentiment is so nice. I need to get my hands on some of this Pink Fresh goodness! Love the bear card! So cute! Love the sentiment on the first card but the coloring on the bears is fantastic. Thanks for sharing. Such beautiful and sweet cards! In your first card, the two stamp sets are paired perfectly, and the second is so whimsical with the two using one scarf. Sweet cards! The snuggle is real is adorable! 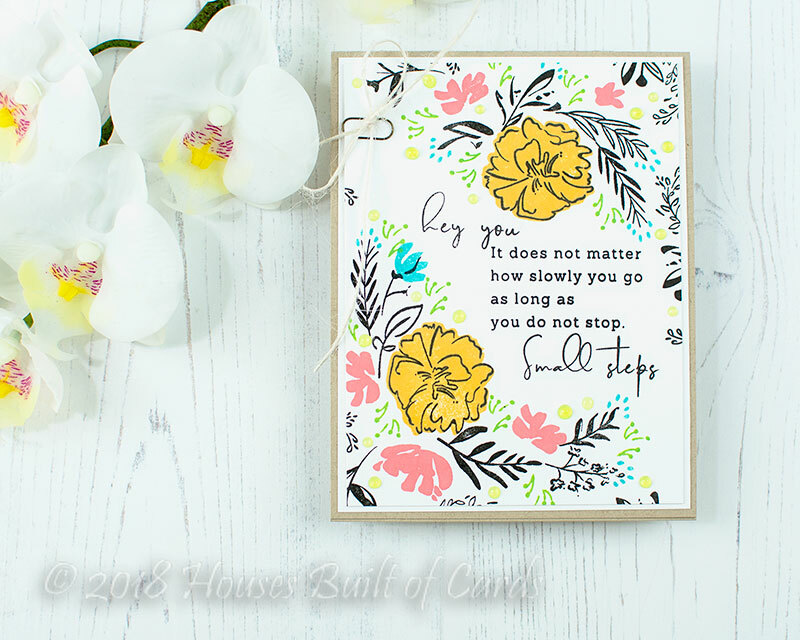 And your small steps card would make a wonderful inspirational hanging to remember to keep going. I love the floral card. The images are lovely and you chose the perfect colors! Wonderful use of text too. Love both cards! I love how happy they make me when I see them. Both cards are so gorgeous. Love the sentiments. These are two of my favorite stamp sets in this release. Great cards! I love those inked flowers! The bears are fun too! Cute! Thank you for sharing your cards & participating in this cool blog hop! are super cute. Fabulous release. Gorgeous sentiment and cute little bears! Love both! Great cards! Happy Hugs is my favorite from this release. Beautiful cards and I really have to have have My Favorite Things to say because they include some of own personal favorites! Love your color choices on the floral card. Very nice. The bears card is so cute, But my fave is the floral card and I love the sentiment! I am so in love with the first card, the colours and the placement, and the different scripts on the sentiment! It all just comes together to make 1 stunning card! OMG,..the Snuggle is Real is so cute! What an awesome release and love the way you used the product! While I really love how cuddly those bears are, your first card stole my heart! So beautiful! Your inked floral card is so lovely! Love the design and that sentiment. The snuggle card is so adorable. Your cards show how this release has something for everyone. Delicate florals to cute snuggly images. Thanks! Your floral card is so pretty! 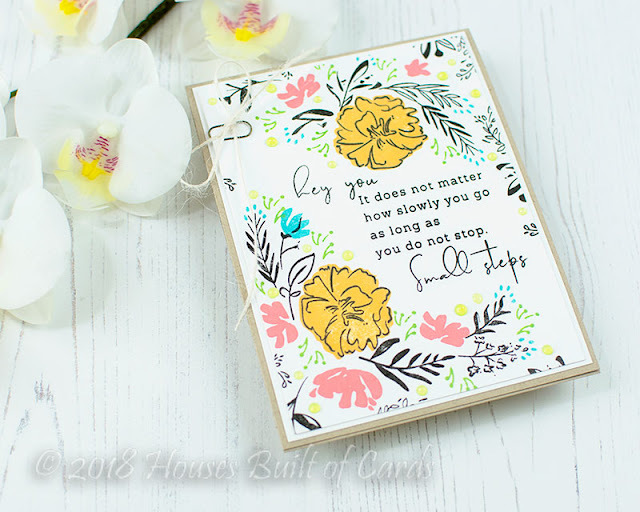 The Inked Florals are lovely framing the encouraging sentiment. The Happy Hugs bears are so cute! I love how they have a frame to fit in to - so clever. 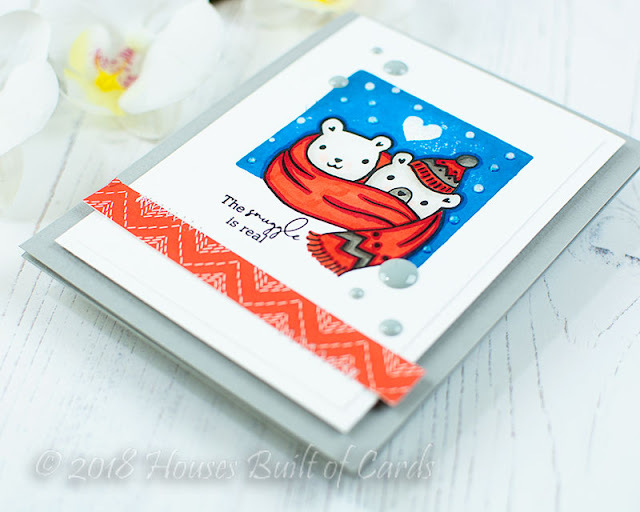 Love both of your cards - colors and the sentiment on the floral card and those bears are too snuggly and cute! Thank you for sharing! I so adore the Happy Hugs stamp that I really need to win this. Lovely and adorable cards! Fabulous designs and creativity. I love the beautiful colors and sentiment in the first card - do elegant. Very cute. I like how you framed the sentiment on the first one and the colors on the hugging bears. Super cute! Love this whole release so much! The cuddly bears are so adorable! Heather you have created some beautiful cards! Beautiful card designs! This is such a great release from Pinkfresh. Love the floral card the layout is absolutely gorgeous. Works so well with sentiment. This is a very cute set of cards! 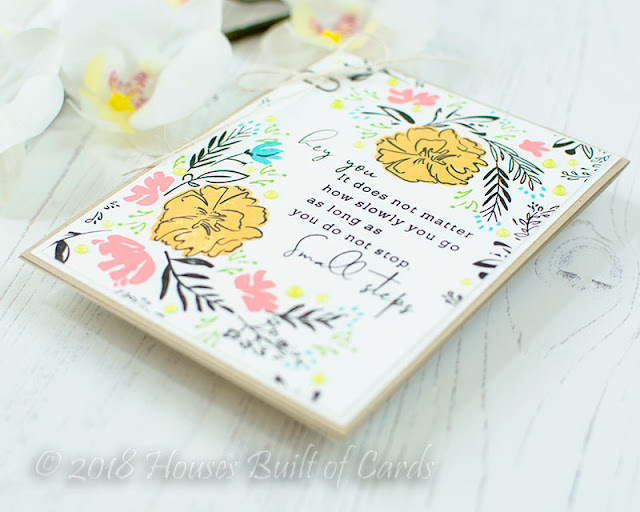 I LOVE the simple and artsy look of the sketched flowers paired with that beautiful sentiment! Beautiful design! This release is so much fun and creative! I love them all. Hats off to the design team for such beautiful cards and ideas! I love the way you used this floral set, and the bears are just so cute!! This is a really great release. Love these cards especially the first one and the sentiment is great. So beautiful! Wow! Your cards are so beautiful! Love your designs! Love these cards! That floral set is really pretty and love those cute bears! I love both cards! I think the sentiment set you used is fabulous. Very pretty floral card with a cool sentiment, Heather! 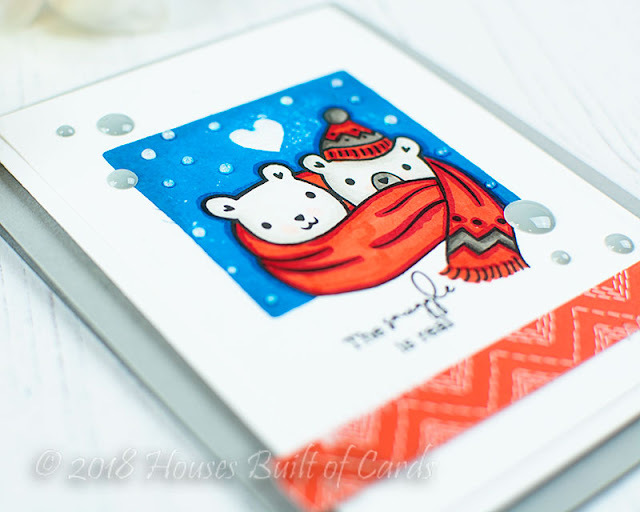 Your bear card with “the snuggle is real” sentiment is adorable with the blue snowy sky and pops of red. Great work and fun Hop! Very cute cards. I love the sentiment on your floral card and the flowers are so pretty. That second card is just too adorable, the snuggle is real is just too sweet. WOW! What a release! I am in love with your first card - the design is lovely, and the sentiment is simply fab! I'm not usually drawn to sentiment sets, but this might be an exception. I think this is one I could get a lot of use out of in a really meaningful way. Don't get me wrong, I love my punny sentiments, but sometimes I want something a little more. And that happy hugs set is AMAZING! I love how you colored them; they look very suggle-able. Thanks for sharing your beautiful cards with us! The first card is absolutely gorgeous. And the second one is adorable. I love your creations. And this release by Pinkfresh Studio is wonderful! Two great cards! Love both sentiments! Happy Hugs is gorgeous in red, white and blue! Loving the newest releases but this is my favorite! Such beautiful cards. Thanks for the inspiration. So many ideas, too little time! Your cards are beautiful and inspiring. Lovely cards and that Happy Hugs set is just adorable! Gorgeous cards! I adore the style of the florals in the first set and your palette. Thanks for the inspiration. great cards and THOSE SENTIMENTS!! Awesome cards! Happy Hugs is adorable! saw you share this in insta, but had to stop bye to say it again, great cards!! I love your cards, especially the sentiment on the first. Good thing to remember.